Today’s post is unusual in that it’s part of a chain of linked posts by finance bloggers on both sides of the Atlantic. It’s about my Drawdown Strategy. This is the first blogger chain I’ve ever joined. The links were already into double figures when I found it, and I enjoyed the first couple of posts that I read. It’s also a subject of increasing relevance to me and I thought I could benefit from clarifying my thoughts. I’m in the process of moving from what is best described as semi-retirement into the Full Monty. And it’s something that isn’t discussed on the finance blogs too much, despite it being the culmination of the financial work that goes before it. The chain began a few weeks ago now when Fritz at The Retirement Manifesto noticed that the Physician on Fire had published a post about his drawdown plan. Fritz thought it would be a good idea if he published a post, and as many other people as possible did so as well. I’ll put direct links to each of these posts at the end of this article (so that you can visit them after you’ve read my version). How much money will I get when, and from where? I decided to read all of the existing links in the chain so that I could refine this a little. You should do the same, but not until you finish reading this post! Unfortunately for me, almost all of the posts to date – apart from Cracking Retirement – are from the other side of the Atlantic, so I can’t steal their ideas directly. But I have used the existing posts to put together a checklist of what I need to cover. this includes any life changes like moving house, college fees, elder care etc. I’m 56 at the moment, and I semi-retired aged 51. Since then I’ve done non-lucrative part-time work1 and run down the taxable assets in my company. My other half (OH) is 54, and still working. Her job is much more enjoyable than mine was. Her current contract ends in August this year and the plan is for her to take a few months off and decide at Xmas whether she should go back to work. So we could be fully retired soon. At the moment I would say we have moved from accumulation into “transition”, but we are not yet fully into decumulation. My life expectancy is 82, so I have 26 years to go (until 2043). OH’s life expectancy is 85, so she has 31 years to go (until 2048). Of course, I hope that we’ll both beat those ages. We eat well and exercise, and we live in a good area. Because of my semi-retirement, we have a fair idea of our spending requirements. These have been inflated in recent years because we’ve been supporting my mother-in-law (MIL) until she sold her flat and moved down to live in rented accommodation close to us. But now the MIL has her own money, and this year’s spending should be a good baseline. We have no plans to move,2 but we currently live in central London so if we do move it will be to somewhere with lower expenses. We have no children, so there are no college funds to worry about. These are much smaller in the UK anyway – perhaps £45K per child. I will make the simplifying assumption that the excess spending in Phase 2 will be cancelled out by the underspend in Phase 3. All this will be adjusted as we go along, of course. To retire safely, you need assets that are at least 30 times your required income. Even if you have more than 30x income in assets, you should think about doing some sensitivity analysis. Other calculators are available – please tell me your favourite in the comments. And we could – if we wished – take 100 years of withdrawals simply from cash. So I don’t need to do a sensitivity analysis. Here in the UK we’re lucky enough to get “free” healthcare, at least at the point of consumption. In fact the NHS is one of the biggest areas of government spending, responsible for more than 20% of taxation. Like all forms of socialised provision / pooled insurance, there are winners and losers. Those on low incomes who need a lot of care do very well out of the system. Those on high incomes who need little care are subsidising the others. But in the context of retirement planning, we need not make provision for unexpected medical expenses. Anyone with more than £23K in assets must pay for their own care. You cannot be forced to sell your home to pay for care if you or your spouse are living in it. Most people don’t need much care, but one in ten has to pay more than £100K. Care can cost up to £50K pa. The government had pledged to introduce a cap on individual contributions (originally set at £35K but later raised to £72K) by 2020. In the 2017 manifesto, the Conservatives scrapped this pledge and instead opted for “further consultation”. They originally planned to include the family home in the calculation of assets, protecting only the first £100K of assets as an inheritance, but this didn’t go down well with the electorate. The election result and subsequent minority government means that no changes are likely in the near future. So we will need to put aside at least £200K for social care. This is clearly not an efficient use of capital and if everyone in the country did the same it would be quite a drag on the economy. Social care is something that the government really ought to sort out. The annual limit for Pensions is £40K and for ISAs is £20K. All growth and income within these wrappers is tax-free. The Lifetime Allowance has been reduced recently from £1.8M to £1M (in stages). At each stage you could take protection for the previous limit, on pain of not making more contributions. So my pension has a frozen limit of £1.25M, whereas OH is capped to £1M, but can still make contributions. The other tax to consider is inheritance tax. Pensions can be passed on tax-free if you die before age 75. And AIM stocks and EIS holdings can be passed on tax-free once they have been owned for two years. I would be worried by a sustained period of high inflation. But that is hard to imagine given the last 10 years of macroeconomics and central bank policies. I’ve written before about the importance of asset allocation. The key point is that you need a plan. You shouldn’t get too bogged down in the details. My own preference is to stick with a large equity allocation into decumulation. I think that target date funds that push you into a higher bond allocation as you age were a better fit for the days when everyone bought an annuity at the start of retirement. Here in the UK, property is a tax-advantaged, appreciating asset. It’s also very expensive, which means that we have more that a third of or net worth in this asset class. This constrains the amount of equities we can hold to around 40%. We also have some themed equity investments (Tech, BioTech, Water etc). And we hold some diversifying assets like private equity, commodities, infrastructure and hedge funds. 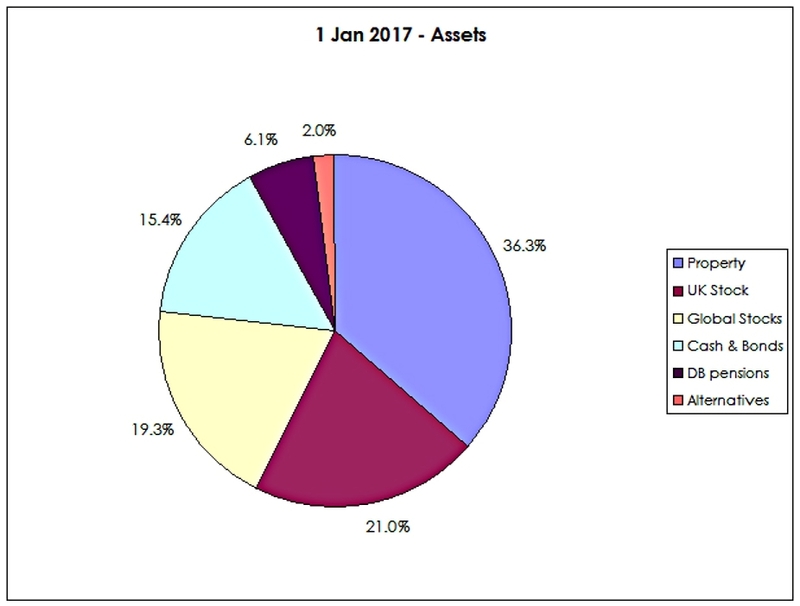 We have a large cash allocation at the moment (15%). This is to cope with emergencies, to guard against sequencing risk (( I don’t want to have to sell stocks during a bear market )) and to take advantage of any market crash in the near future. One asset that I don’t hold directly is P2P loans. Interest rates have come down significantly, and the tax-treatment is unfavourable. If a SIPP or ISA platform allowed a “mix-and-match” approach between providers, I would reconsider. For now I will access this asset class via investment trusts. Finally we get to the meat of the plan. We will take money from our SIPPs first. This is because we have income tax allowances (0% and 20%) to use up each year. And because I expect taxes in the UK to rise in the future. I think the ISA will survive any changes in better shape than the Pension. The 20% limit is now £45K pa per person. Add back the 25% tax-free amount and you can potentially withdraw £60K pa without paying 40% tax. There is no way we can spend close to £120K pa, so I expect to recycle £40K pa back into ISAs. Any cash left beyond that will go into VCTs and EIS to reduce our tax bill. 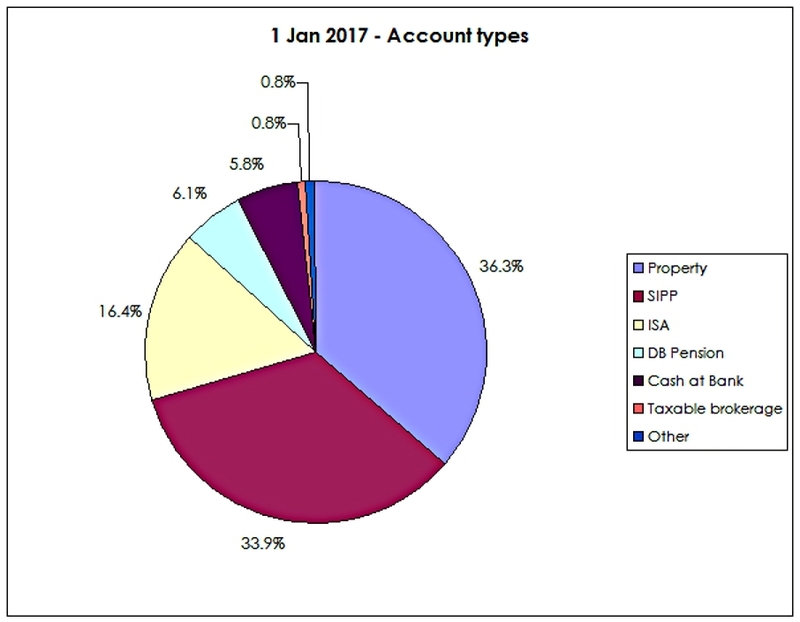 As the Company and State Pensions kick in, the amount withdrawn from our SIPPs each year will reduce. If we ever exhaust our SIPPs, we will move onto our ISAs (which should be a lot larger by then). Because of the £1.25M protection, I have some headroom for my SIPP to grow. So I will probably use the UFPLS (uncrystallised funds pension lump sum) option, as detailed here. For OH, it will make more sense to move her pensions directly into Drawdown. You might be wondering why neither of us plans to take the 25% tax-free lump sum from our pensions. It’s basically because at the moment we have no use for a cash lump sum. So we would just be converting tax-sheltered money into taxable money. If the situation changes – perhaps we might want to buy a seaside cottage – then we will revisit the strategy. And that’s it for our Drawdown Strategy. Mike, thanks so much for joining The Chain Gang!! You’re officially in as “Link #12”! I love your detailed strategy, and appreciate you adding to the discussion on a topic which is under-reported in the FIRE community. Thanks to you, and the others in the chain, we’ve added some serious content which will bring value to those designing their own drawdown strategy. Even better, we now have two British perspectives on the topic, which is invaluable. Your strategy appears well thought out, and I wish you the best of luck as you execute the details! Great to see another UK contributor to the chain gang… I’m interested that your ISA’a will be spent after your SIPPs because I have my proposal the other way round. Mainly because we can hopefully leave our SIPPs to our 2 sons… But as my life expectancy has me at 100, I might have used it all by then, if inflation goes mad. I love reading your articles, they always give me food for thought. Nice to see you join the chain, Mike. With 100 x your expenses a pension, you look golden to me! Thanks – I usually feel that way, but we’re a few votes from communism over here! Though I may not join the chain but I am passionately following the trends. Mike, you post actually challenged me. You mentioned that you have seven sources of income. This is a food for thought for me. I hope other people will pick the point too. Thanks for sharing this piece with us. Thanks / you’re welcome. There are seven potential sources of income (actually ten if you include the three I ruled out in the section below). But we will only be using five of the seven (or five of the ten, if you prefer).